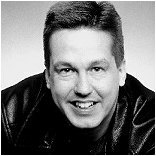 Jeff McKeehan, a classically trained musician, began his DJ career in 1983 at The Library Lounge, in Lexington, Kentucky. In 1984 he teamed with Greg Lee and Glenn Cattanach to create two medleys for Hot Tracks, the 1984 Top 40 Medley and the The 1984 Best of Hot Tracks Medley. The trio re-united in 1985 to produce the Best Of 1985 Top 40... Octomnipent Zeitgeist Medley, which spanned two issues of Hot Tracks. Jeff also created the “Bump ’n Shuffle Mix” of Contact, by the Pointer Sisters, for Hot Tracks. After moving to Connecticut in 1986 he DJ’d briefly at The Brook, in Westport. Jeff currently resides in Scottsdale, Arizona.